Shot in Charleston, SC the bride and groom pause in the middle of the road for a quick kiss while the rest of the wedding party continues excitedly past them. We love to do shots that are different than the average wedding shots. This is one where we messed with a low exposure to get a burry effect when there are moving parts. 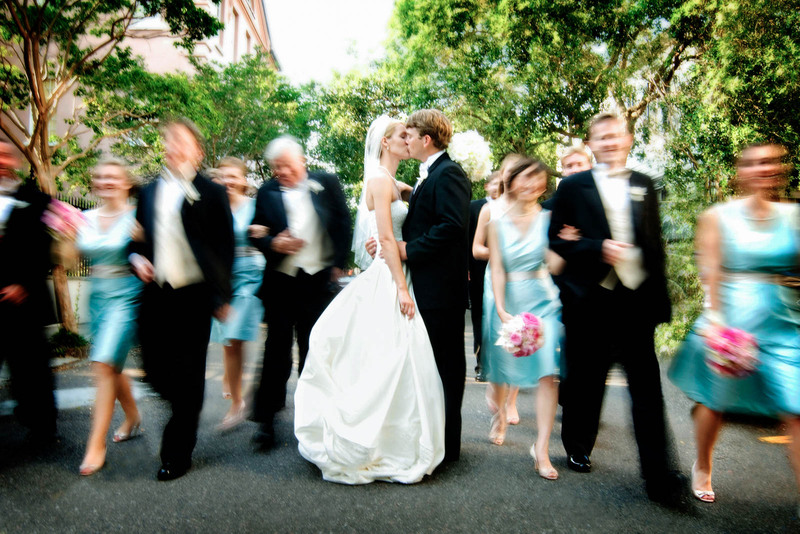 We were all walking around downtown Charleston after their ceremony enjoying the beautiful weather. Getting walking shots with the wedding party and the bride and groom is something we do to get those fun moments with your favorite people. Grabbing the bride and groom to be in the middle of the bridesmaids and groomsmen to get a walking shot we thought why not get the wedding party to walk and have the bride and groom do their own thing in the middle of them. Doing this really made the focus on the bride and groom and made the shot tell a story that they are the only people in the world that mattered in this one shot. Pretty cool, huh?